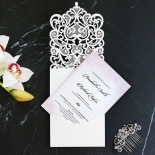 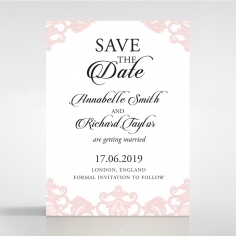 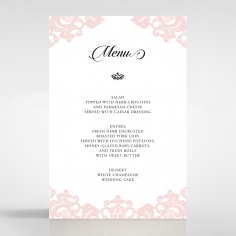 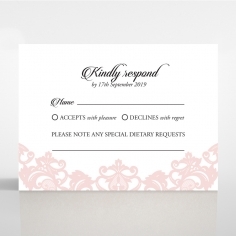 Fabulous in pristine white, this contemporary and chic invitation is incredibly astounding pocket ensemble design. 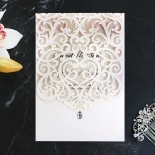 The pocket is intricately created with a flawless white pearl stock using the latest in die laser cutting techniques to produce exquisite ornate patterns. 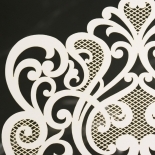 Once the flap is lifted, an inner card is revealed that is embellished with a stylish baroque frame. 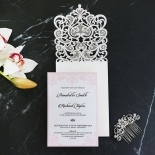 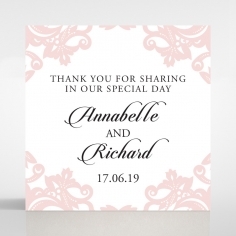 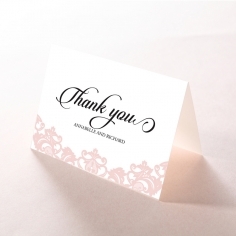 To heighten the classic feel of this stationery, gorgeous calligraphy is used for your wording. 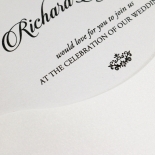 If you want to personalise it further, opt for another font style, hype up your wording and even change the layout. 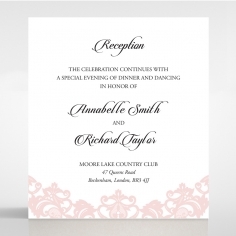 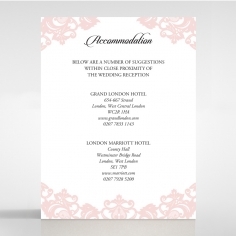 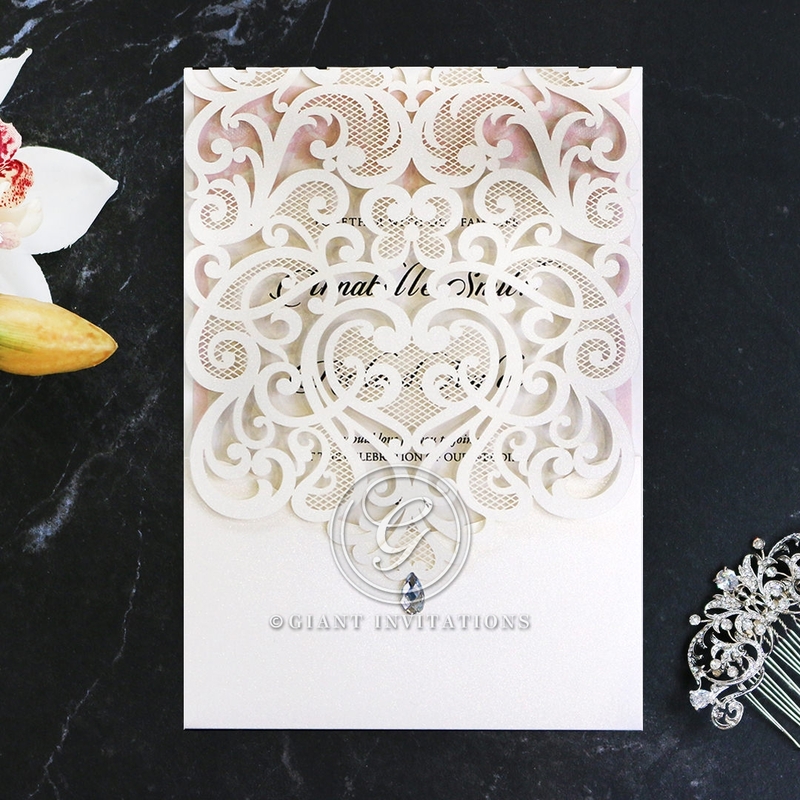 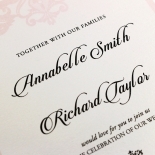 The immaculate feel of pure ivory makes this invite truly exceptional for any type of wedding. 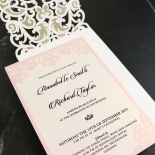 This invitation is beautiful. 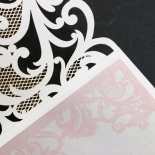 The holographic paper is stunning and so is the pattern of the pocket. 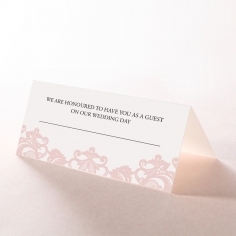 I don't like the pink pattern on the card, I think it would look nicer with the simple holographic paper. 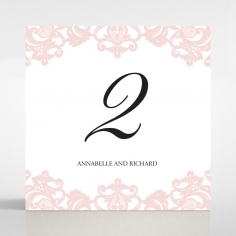 This was my partner's favourite, as it was so pretty, elegant and matched our venue and colour theme well, however my parents (more traditional) thought it was too much. 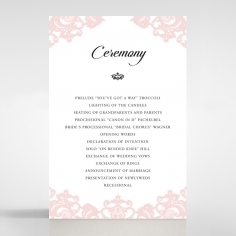 Overall a beautiful invitation but probably a bit too busy for us.